The Wall Street Journal just gave a nice nod to 2GIG, touting the 2GIG Alarm Kit in a recent technology article. You can’t judge an alarm system by how it looks, but the 2GIG Alarm Kit’s control panel is so much more elegant than any other security solution out there, it’s hard to justify devoting the wall space to anything else. Instead of a clunky keypad that makes you feel like you’re working the midnight shift at a convenience store, the 2GIG control panel is a sleek white box with a color touchscreen. Most security systems are programmed to have a brief delay before going off when you walk in the back door. This 30 second delay or more gives you time to disarm the system and prevent a false alarm. What would happen if a burglar came into your home and heard the control box beeping? What if he knocked it off the wall or otherwise demolished it to prevent it from calling? With Alarm.com’s exclusive technology, security system destruction can be detected during the entry delay, dialer delay or alarm dialing process, ensuring that even if an intruder is able to locate and disable a control panel in a “Crash & Smash” attack, Alarm.com will still be able to send a signal to the central station for help. Even better, Alarm.com’s advanced technology enables the use of important false alarm reduction features, without compromising security in the event of a real intrusion. Burns & McBride Home Comfort and Alarm.com today announced the release of new Severe Weather Alerts that provides customers advanced warning of impending severe weather in their area. Alarm.com tracks severe weather warnings issued by the National Weather Service and provides real-time alerts to customers when a severe weather warning is issued near their home or business. 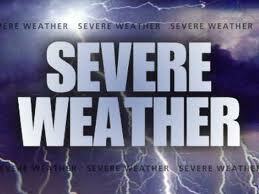 Things like flooding, thunderstorm, high wind or hurricane warnings will be sent out to you automatically. The alerts are integrated with Alarm.com’s proven technology platform and are delivered directly to the customer’s security control panel giving them additional time to seek protection from dangerous weather conditions. 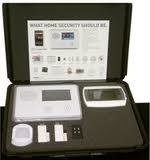 Alarm.com technology is standard on every Burns & McBride Smart, Safe Home system. Since 2000, Alarm.com has been the leading provider of interactive security services for homes and businesses. This new capability extends beyond the traditional property line to alert people of external events which could put their families and belongings at risk. Many people are caught off-guard in severe weather situations because they are not listening to the radio or watching TV when a weather warning is issued. Alarm.com’s Severe Weather Alerts ensure that if a person is inside their home or business he or she will be forewarned when a tornado, tsunami or fire is headed their way. Burns & McBride, deployed Severe Weather Alerts throughout their customer base this spring and is including it on a standard feature on their Smart, Safe Home system. Burns & McBride and Alarm.com is committed to developing innovative products and features to increase security, safety and convenience for their customers. For more information on Alarm.com’s products, services and technology, visit www.alarm.com. 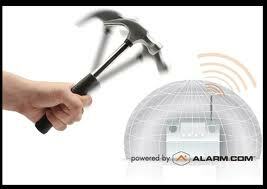 Alarm.com, founded in 2000, is the industry leading technology provider of interactive security solutions. Through advanced wireless monitoring, mobile and web-based services, and a proven hosted services platform, Alarm.com helps protect hundreds of thousands of residential and commercial customers throughout the United States and Canada. Alarm.com’s products and services are offered exclusively through a network of over 2,000 licensed and authorized Security Dealers. Alarm.com’s headquarters is located in Vienna, VA. For more information, visit www.alarm.com. The Burns & McBride Smart, Safe Home system uses Z-wave technology to control your lights, thermostat, locks and even appliances from anywhere. It is a standard feature of the system. Home Security 101 – What is “Z-Wave”? Z-Wave makes any home a “smart home” – quickly, easily and affordably! Z-Wave is a wireless system that lets all your home electronics “talk” to each other, and to you, via remote control. It uses simple, reliable, low-power radio waves that easily travel through walls, floors and cabinets – sort of like a baby monitor. Z-Wave control can be added to almost any electronic device in your house, even devices that you wouldn’t ordinarily think of as “intelligent,” such as appliances, window shades, thermostats and home lighting. Z-Wave ties all your home electronics into one integrated wireless network, with no complicated programming and no new cables to run. Any Z-Wave enabled device can be added to this network, and many non-Z-Wave devices can be made compatible by simply plugging them into a Z-Wave accessory module. In seconds, your device gets joined to the network and can communicate wirelessly with other Z-Wave modules and controllers. And Z-Wave lets you control these devices in ways that give you complete command even when you’re not at home yourself. You can control your Z-Wave household remotely from a PC and the Internet from anywhere in the world…even through your cell phone! • Z-Wave Is Simple – Z-Wave control is easily added to almost any device in minutes. Simply plug the device you want to control into a Z-Wave module, and “join” it to your Z-Wave network! • Z-Wave Is Modular – With Z-Wave, you can add as much or as little home control as you want over time. You can add Z-Wave to a device, a room, a floor or the entire home, according to your needs and desires. • Z-Wave Is Affordable – Unlike costly whole-home control systems that need special wiring and professional installation, Z-Wave is accessible and easy for the do-it-yourselfer. • Z-Wave Is Powerful – Z-Wave’s intelligent mesh networking ‘understands” the present status of any enabled device, and gives you confirmation that your devices have received the automatic or manual control commands you want. • Z-Wave Is Versatile – Z-Wave can be added to almost anything in your home that uses electricity, and gives you the power to control or monitor them from your home or away from home. • Z-Wave Is Intelligent – Z-Wave enabled devices can work together as a team. Have your garage door turn on your house lights when you come home. Have your door locks notify you when your children arrive home from school. Turn your downstairs lights off from upstairs. Create your own intelligent control “scenes” with Z-Wave! As we’ve talked with homeowners, we’ve learned that there is no substitute for actually trying the Burns & McBride Smart, Safe Home system and finding out just what it can do. Our technicians have put together a demonstration kit that we can bring to you. It shows you how the system can protect your home, lock and unlock doors, adjust the thermostat and even turn lights on and off. Call us today at 302-656-5110 or visit our website at http://www.burnsandmcbride.com. We’ll be happy to schedule a time that’s convenient for you to actually try this system out. How Can You See The Smart, Safe Home System In Operation? The Burns & McBride Smart, Safe Home system can do all sorts of things but at its core it provides affordable home security, pays for the monthly monitoring cost with energy savings while not requiring any long term contracts. We believe that the best way to understand how this system works is to spend 30 minutes actually using the system.